Gmail supports signature but it won’t allow you to use multiple signatures. 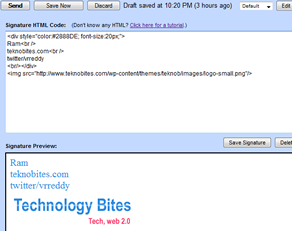 Blank Canvas Gmail signatures is a Firefox addon that allows you to create four HTML signatures for any Gmail account. You can create up to four HTML signatures, Default, Business, Family and Friends so that you can use different signature based on the purpose of your email. Once installed the addon adds a simple menu to the Gmail compose editor. You can select any one signature from the drop down menu, first time you need to create a template for the signature and fater that simply select one. For creating signature you can use HTML and inline CSS, remember mail programs may not support external CSS so be sure to use only inline CSS.